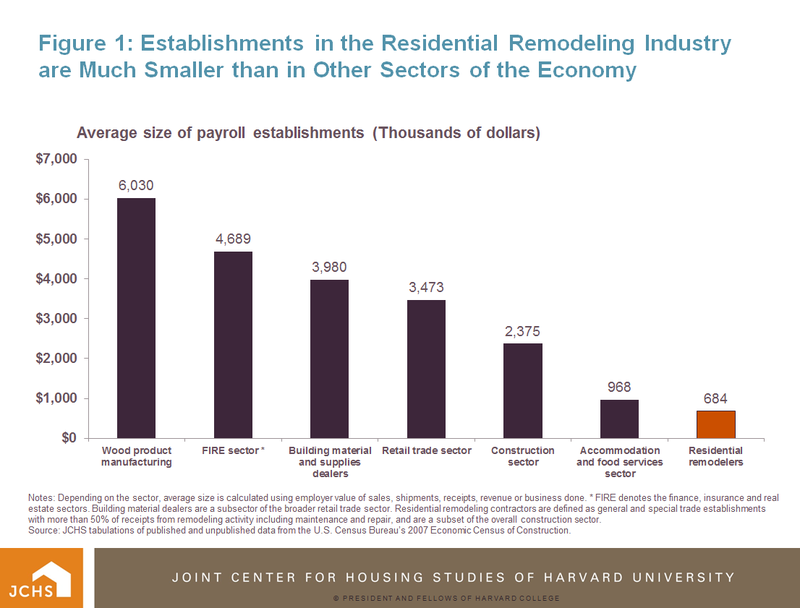 Housing Perspectives (from the Harvard Joint Center for Housing Studies): How Can Remodeling Companies Achieve the Benefits of Scale? How Can Remodeling Companies Achieve the Benefits of Scale? The residential remodeling industry faces many obstacles to scale economies, including low barriers to entry, volatile business cycles, highly customized work, and difficulty attracting capital. For this reason, the industry continues to be highly fragmented, with the vast majority of remodeling companies operating as relatively small, single-location businesses that likely will not experience any significant growth over their life-cycles. 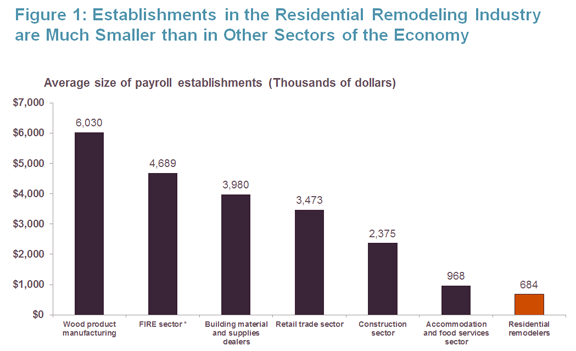 According to data from the U.S. Census Bureau, the average size of remodeling contractors with payrolls, in terms of annual revenue, is significantly smaller than in other major sectors of the economy: about one-third the size of firms in the broader construction sector, one-fifth the size of retailers and about one-tenth the size of wood product manufacturers (Figure 1). Indeed, residential remodeling contractors are even smaller in scale than the typical business in the fractured restaurant and hospitality industry. Notes: Depending on the sector, average size is calculated using employer value of sales, shipments, receipts, revenue or business done. * FIRE denotes the finance, insurance and real estate sectors. Building material dealers are a subsector of the broader retail trade sector. Residential remodeling contractors are defined as general and special trade establishments with more than 50% of receipts from remodeling activity including maintenance and repair, and are a subset of the overall construction sector. Source: JCHS tabulations of published and unpublished data from the U.S. Census Bureau’s 2007 Economic Census of Construction. Yet, evidence suggests that remodeling firms able to overcome these obstacles enjoy significant benefits from scale. Better understanding of the ways in which remodeling companies are overcoming the many hurdles to scale, as well as how industry manufacturers, distributors, and franchisors are supporting scaling and consolidation efforts within the industry, can provide insight into how the industry is likely to continue evolving over the next several decades. Most of the largest remodeling companies today are specialty firms: replacement roofing, siding, windows, doors, flooring, or painting businesses, for example. Specialization allows companies to develop greater efficiencies in their operations and obtain more favorable pricing on materials compared to full-service remodeling firms. Specialty projects also tend to be relatively straightforward and less labor intensive for scheduling and installation, which means shorter job cycles and higher margins. Specialty firms have been pursuing scale in the remodeling industry by heavily focusing on corporate sales and marketing strategies and by integrating vertically (i.e. the company owns the supply chain). Manufacturers and distributors, including retailers, arguably have the greatest motivation and investment capabilities for influencing scaling and consolidation in the industry through their installed sales and preferred contractor programs. Such programs encourage further specialization of remodelers and offer training and expertise in professional marketing, sales, installation, and business systems to help contractors improve their operations. Installed sales and preferred contractor programs push industry standards by requiring licensing, insurance, minimum years in business, and good business and customer satisfaction practices of participating contractors. Manufacturers and big box retailers will surely continue to leverage their national trust and brand recognition to further expand installation services to consumers, though it is unclear whether they will move further into this space through in-house expansion or through acquisition of established contractor companies. Either way, manufacturers and distributors will likely be a formidable force behind ongoing consolidation in the industry. Franchising, licensing, and similar business models have already been successful strategies for growing a remodeling business toward a national presence. Such models allow a business to quickly expand its brand recognition and market reach without investing significant capital in acquiring new locations or managing each independently-owned and operated franchise, dealer, or affiliate. Through such agreements, franchisee companies gain a recognized brand name, proven business systems, training and marketing support, and access to a peer network of other franchisees for best practices advice. Overall, franchising and related efforts in the remodeling industry tend to be more successful with specialty businesses because of their streamlined operations. Also, since installation is relatively simple and systematic, specialty firms tend to focus strongly on sales and marketing for achieving scale. The home remodeling industry will likely always include some amount of fragmentation due to low barriers to entry and other challenges to scale. While the industry may never reach the same level of concentration as other industries in the broader construction sector, the sheer size of the home remodeling market—which the Joint Center estimates at $300 billion annually—and its continued fragmentation present major opportunities for companies that are organized, differentiated, and focused on brand-building.